The incident at Sheppey crossing in Kent is happened this morning when poor visibility conditions hampered motorists. 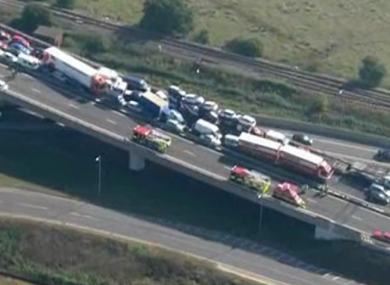 UP TO EIGHT PEOPLE have been seriously injured following a motorway pile-up in the UK this morning with a further 60 people suffering minor injuries. Around 100 vehicles are believed to be involved in collisions on Sheppey Crossing in Kent after poor visibility conditions hampered motorists. Kent Police originally said that there were over two hundred people injured but later reduced the figure. Firefighters were needed to free a number of people from their vehicles. Traffic was closed in both directions on the bridge which which was busy with early morning commuter traffic. The incident on the Isle of Sheppey happened at around 07.15 am this morning with eyewitnesses saying the crashes continued for between five to ten minutes. Email “Eight seriously injured in 100 vehicle UK motorway pile-up”. Feedback on “Eight seriously injured in 100 vehicle UK motorway pile-up”.